I have recently joined Sotheby's and am putting together their first Space History sale since the epic Russian Space History sales of the 90s. I am looking for key items from both the Russian and American space programs, with a particular interest in hardware and flown items. If you have been holding on to something really spectacular, this is your chance to have it featured in a high-end, world class auction. Sotheby's is very pleased to be holding two Space Exploration-themed sales, the first since the groundbreaking Russian Space History sales of the 1990s. In the intervening decades, the enthusiasm for Space Exploration has greatly increased, and the collecting field in both American and Russian material has grown dramatically. Timed to coincide with the anniversary of the Apollo 11 lunar landing, with a live sale taking place on 20 July, and an online only sale running from 7-21 July, there will be a wide variety of material from both the American and Soviet space programs suited for both new and seasoned collectors — from flown mission artifacts and hardware, items from the personal collections of astronauts and cosmonauts, space photography and signed photographs, maps and charts, signed books, engineering models and other 3-D objects, and much more. Will there be a physical auction catalogue available for this? Yes, there will be a physical catalogue for the live sale. If you send me your mailing address, I will be happy to make sure you receive a copy. An Apollo 11 moon rock bag that was at the center of a legal dispute is now set for what could be a record-setting auction. 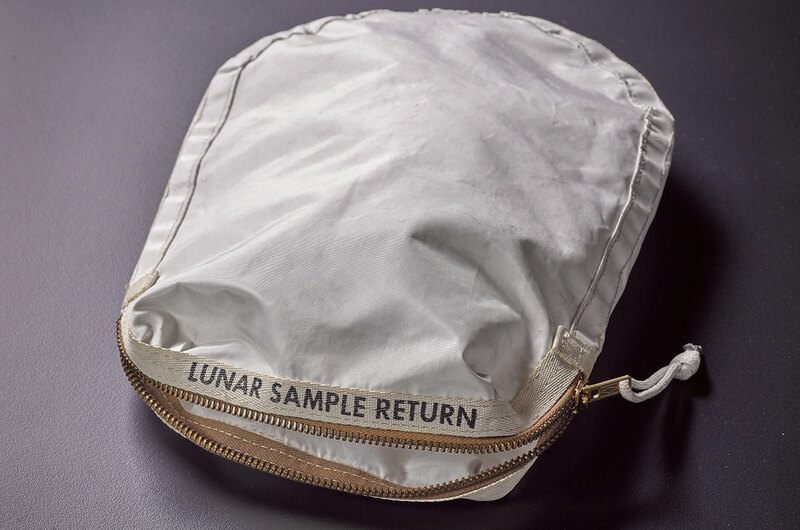 The moon-dust stained, lunar sample return pouch will be offered as part of Sotheby's first space history-themed sale to be held in more than 20 years. The auction is scheduled for July 20, the 48th anniversary of the Apollo 11 mission's historic first moon landing, in New York City. The zippered bag, which was used to protect the first-ever samples of lunar material collected by an astronaut on the surface of the moon, is expected to sell for $2 to $4 million — potentially more than any space exploration artifact has ever commanded at auction. When Nancy Lee Carlson discovered an online auction two years ago for moon dust, she couldn't believe her luck. A geology buff, she spent childhood summers scouring for rocks along Michigan's Lake Superior, but wasn't a serious collector. She figured the dust was genuine because it was being auctioned on behalf of the U.S. Marshals Service. "Ooh boy, that's something I'd love to have," she recalls thinking, remembering the astronauts and spacewalks she watched growing up. The 62-year-old hadn't bid on anything as high as its estimate—$995—but the white, zippered pouch containing the moon dust was bundled in a group with a launch key for the Soviet spacecraft Soyuz T-14 and a black padded headrest from an Apollo command module. She decided the pieces "had a story I could figure out," so she clicked once and won. After months of sleuthing that led to a legal showdown with the National Aeronautics and Space Administration, she indeed figured it out: The U.S. government mistakenly sold her some of the first moon dust it had ever collected. What do you think the probability is of a museum raising enough capital to buy this? Not likely. Best bet is for someone to buy it and place it on loan at a museum, but even that is iffy since it would require a significant investment to make sure the item remains protected. Often, when items are offered on loan to a museum they must also come with the resources to protect and display the item. I suspect this item will be purchased and kept in a safe or safe deposit box. Museum loans though, are not without precedent. The highlight lots at Sotheby's 1993 Russian space memorabilia auction and the Vostok capsule that Sotheby's sold in 2011 (which currently holds the record for the most ever paid for a space artifact at auction) were purchased by businessmen and placed on long-term loans at museums. I am very pleased to announce that the catalogue for our July 20th Space Exploration Sale is now online. For those that prefer to view a browsable version, that can be viewed here. Printed catalogues should be available around the 27th of June. Please let me know if you would like a copy. Some of you may also be interested to see the slideshow I put together about some of the photography of the moon and Mars in the auction. Interesting set of estimates. Some of the signed pics seem wildly high, while at least one important artifact seems rather low. Maybe the estimates are not that "wildly high" given a Buzz visor shot sold at Bonhams last year for in excess of $21K. Although most auctions seem to have the item or two that defy auction expectations and bring what most would consider insane pricing (Buzz Aldrin visor shot), I do not think that sets the price for future auctions. More likely, it sets the threshold for the losses of the overzealous bidders. I do not believe a resale of that Buzz Aldrin photo would bring that much again and there are hundreds of items sold that may never resell for the amount paid at auction. This is why, where auctions are concerned, I have always said, "It is not what an item is worth, it is what that item is worth to you." I am actually in full agreement with Chuck in that there is no way a visor shot will command that much in a future auction. In any auction there can always be a surprise, however, the "guys" are fully aware of the rising resale prices reached with these large formats and consequently are charging extremely high prices to inscribe and sign. In the case of a visor shot lengthy mission inscription on a large format the cost is well beyond what most collectors are prepared to pay. "Most..."
A reminder that our Space Exploration sale with take place this Thursday, July 20th. Session 1 with lots 1-77 will begin at 11 am EST, and session 2, with lots 78-173 with begin at 2pm EST. For those bidders who are unable to attend and bid in person, you can place absentee bids in advance, arrange to bid via telephone, or bid online via our website. Instructions on how to do so can be found here. The sale is also up on Invaluable, though I have heard reports from friends and colleagues about having trouble bidding via that platform over the past couple of days - we should not have any of those sorts of technical issues with the Sotheby's website. As always, feel free to reach out if you have any questions about any lots in the sale, or need any assistance getting set up to bid. In case anyone has trouble locating the sale on our website, you can view it here. A small, empty cloth bag is expected this week to rocket past space capsules and a wristwatch worn on the moon to become the most valuable space artifact to ever sell at auction. Watching the Sotheby's auction and can't believe some of the prices items are selling for. Twelve Lion Brothers Apollo patches sold for $4800 plus buyer's premium. An Apollo 8 Earthrise photo sold for $26,000 plus buyer's premium. A Snoopy astronaut doll signed by Cernan sold for $22,000 plus buyer's premium. Unbelievable! I'm with you. Most of the prices seem way high. 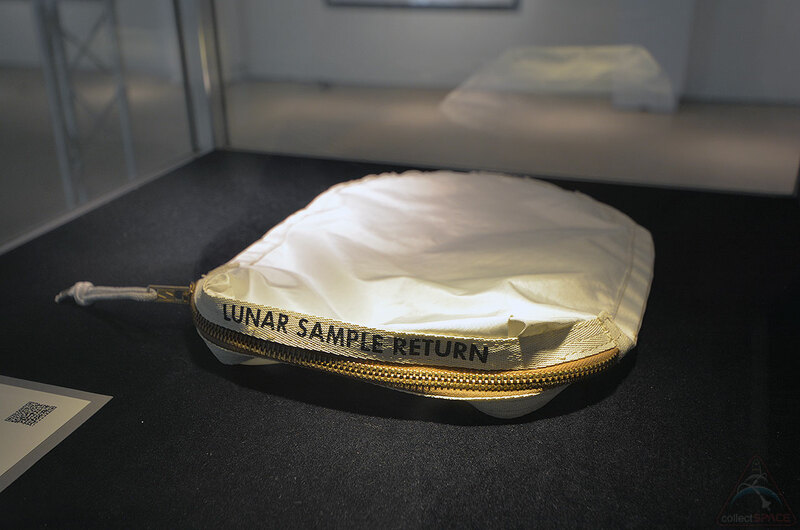 On the other hand, the much publicized lunar sample bag only went for $1,812,500 USD (hammer price with buyer's premium), which didn't even get to Sotheby's $2M-$4M expected range. Watching the other prices, I was expecting it to go over $4,000,000 easily. Buzz Aldrin signed 8x10 for $18,000!!! I think those of us who have a large collection that have similar items are amazed. However, you have to ask who is doing the buying and why they are paying these prices. A lunar module model that typically goes for $400 to $800 selling for $6,250 with buyer's premium. Makes you want to sell your seconds next time. The Apollo 13 Flown Checklist got me, $220k plus premium. A Charlie Duke signed 16x20 photograph sold for $30,000 plus buyer's premium! Is there a place to see final prices? I'm having a hard time finding it. See the results posted to Sotheby's website. A cloth bag used to protect the first-ever moon rocks collected by an astronaut on the lunar surface 48 years ago Thursday (July 20) has made history again — this time by selling at auction for more than any other U.S. space program artifact to date. The sale fell short, however, of commanding the most ever paid for a space artifact overall, closing at a lower hammer price than its pre-auction estimate of $2 to $4 million. 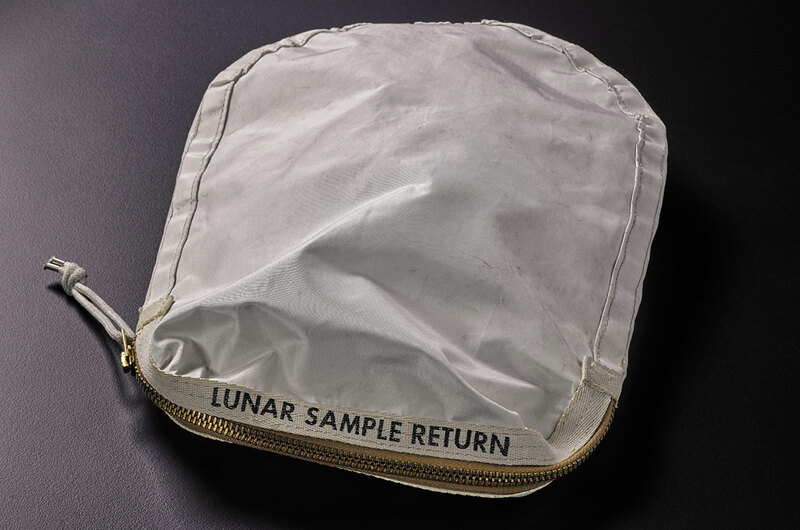 The moon dust-stained "lunar sample return" pouch, which Apollo 11 commander Neil Armstrong used to store a small "contingency" cache of material from Tranquility Base, sold for $1,812,500 million at Sotheby's New York on Thursday (July 20), the 48th anniversary of the Apollo 11 first moon landing. The bag's sale was part of Sotheby's first auction to focus on artifacts from NASA's space missions. It was great to see some cS'rs in attendance at today's sale, both old friends and new acquaintances. It was also good to meet Cassandra and some of the other members Sotheby's staff. The day before the sale, while previewing the lots, I bumped into the son of an astronaut doing the same. In the post-sale press release, Sotheby's noted that the winning bidder of the Apollo 11 moon rock bag is a private individual and an American. The Apollo 11 flown Beta cloth patch and the Gemini G1C thermal cover layer were each sold to an American institution. Like others, I was surprised by some of the results, though I believe some of the high prices, like the Lion Brothers patches selling for $4,800, are more a factor of Sotheby's reaching an audience new to space memorabilia. That said, the $50K sale of the orbiter processing computer (lot 39) is interesting, as it might be the first time a shuttle era artifact performed on par with an Apollo 11 artifact (a flown flight plan page sold for $50K, too). I suspect high profile sales like this draw in a lot of deep pocketed bidders who jump into the fray with no knowledge of the market. They want a nice piece for their office or den... $20,000 isn't a lot to them. They are not day-to-day collectors who are going to buy something from eBay or shop around at Astronaut Archives. Rob, it was good to see you there and happy 18th birthday for collectSPACE. Just celebrated my 14th year as a member. Continue on with the good work! I'd suspect many of the buyers don't know what eBay is and even if they did they wouldn't spend the time looking there. Either way I would say Sotheby's did very well, kudos to them. Rising water floats all boats. This kind of media coverage and results are good for the whole hobby. Rising prices are good for sellers, not good for buyers that do not intend to sell in their lifetime. The "it's going in the casket with me club" is very small. Most collectors — or their estates — will sell someday. The way I see some of the same items continuously flipped, I sometimes think holding something for more than a year is "long-term" these days. Hmm, so how do you see prices going (up-down) in the 10 or 20 years ahead (basically when we will be all dead )? I'm in my 40s, so I sure hope I'm still around in 10 or 20 years! The hobby will still be here. It will have ups and downs as it always has. I think a lot will be dependent on the status of space travel and what countries are participating. Can you imagine what would happen if interest in collecting sparks in a growing Chinese middle class? There is a demographic challenge with the boomers starting to age out and sell off, but I see a surprising amount of younger collectors using my service. It's not all gloom and doom. I don’t think that after a year it is a time for sale, but 5 to 10 years can definitely be a lifecycle of a collectable item within ones inventory. Many think that collectors are guys with fat pocket full of money, but in most cases we have the same constraints as all others and affected by the same circumstances besides general loss of interest at some point. I am 40 and hope to have several good decades of collecting!